Happy Dr. Martin Luther King, Jr. Day to all the readers of the Dot Org Solutions blog. This is my first blog post of 2019 – and, needless to say, I am thrilled and also honored to be writing on this special holiday. Dr. King was one of the most influential activists during the civil rights movement. He promoted equality for people of color by organizing marches, participating in peaceful protests and speaking to crowds of people. While it has been 41 years since his untimely death, Dr. King’s tremendous impact can still be felt by Americans today. Citizens still gaze at the statues of his likeness in wonder; they still spread his message of equality; and they still read, and sometimes listen to, his speeches with amazement. We can all take away some type of lesson from Dr. King’s most popular speeches. Of course, we can all learn how to create a more inclusive world. However, marketing and communications professionals, grant writers and other “content developers” in the nonprofit sector can also learn how to create better materials, solicitations, e-books, articles, advertisements – and, yes, even blog posts. Ask yourself: What is the goal of your content? Ultimately, Dr. King wanted to create a more inclusive, peaceful world. Most of his sermons and speeches, though different in some ways, focused on inspiring others to achieve this goal. Ask yourself this question: What is the goal of your content you are developing? If you are a marketing professional for a nonprofit, one of your main goals might be to promote your organization to key audiences. If you are a grant writer, perhaps your goal is to receive funding for an impactful nonprofit program. Whatever the case, make sure to tailor the key message of your content with your organization’s goal in mind. There are many reasons that Dr. King’s speeches are memorable. Of course, one reason is because they were essential and relevant for many time periods – however, it is also because Dr. King always kept his audiences in mind. Dr. King crafted his speeches so that they would resonate with the American public – the “everyday man and woman” who were working to make a change. He used similes, told relatable stories about his children and created powerful imagery to effectively deliver his message. When developing content, remember to consider your own audiences. If you work as a marketing professional with fundraising responsibilities, the message you convey to donors will be entirely different than the message you create when posting on social media. Think about who you are addressing and adjust the verbiage, use of jargon and length of the content accordingly. 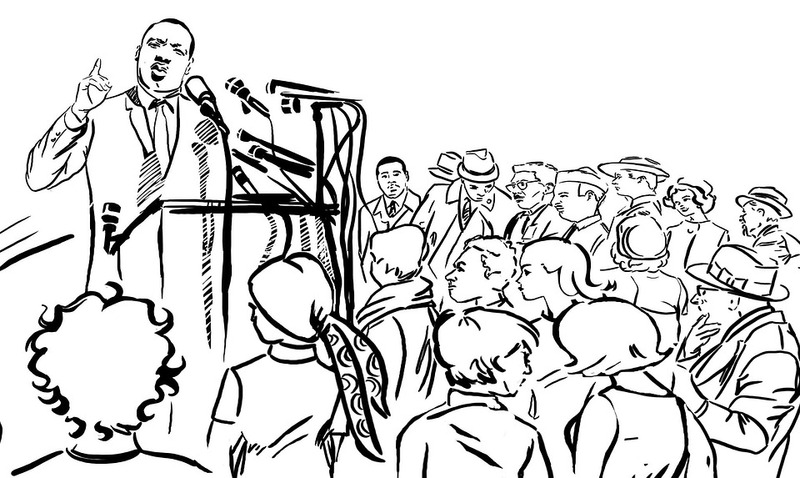 You want your content to make the right impact on the right people – just like Dr. King did. Include a memorable statement, statistic or quote. Powerful statements such as these tied Dr. King’s speeches together and made a lasting impression on listeners, from the fifties and sixties to now. When you are crafting your content, think about brief, concise messages that will stick with your audiences. For grant writers, this could mean including a surprising statistic on how your nonprofit’s program will make a tremendous impact in your community. For professionals developing a marketing campaign, this could mean creating a tagline about your organization that is catchy and easy to remember. Dr. King made history: he stood up for what he believed in, represented the underrepresented and created rhetoric that inspired generations of audiences. His speeches made a difference – and the content you create can make a difference, too, whether it is in a big or a small way. To the “content developers”: We are lucky that we can use our craft to make an impact. So, keep plugging away! Overall, a lot happens on this very special holiday. Some people treat it as a day of service, and they volunteer to benefit their fellow man. Others treat it as a day of reflection on today’s current social climate. Hopefully, though, we will all treat it as a day to remember a truly remarkable historical figure – and then continue to carry his lessons in our words, our work (yes, I’m looking at you, “content developers”) and our lives for every day of the year. Need “content developers” to help your nonprofit? Contact us at 330.247.2180 or at [email protected].